How would you like to be more confident that you can handle the self defense scenario that you will face? We want to help you through relevant skill and mindset development to achieve your goals. Always receive professional training before arming yourself. We are not attorneys. We do not give legal advice. We give practical advice. In all instances, anyone associated in any way with this class expressly disclaim any liability that may result from the use or misuse of any of the techniques or other information featured in this class or links from this Class/website or any other source. Safety for you and your family is your responsibility. Welcome to Step By Step Gun Training. 1. We want you to be competent, confident and SAFE! 2. 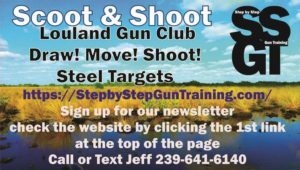 We offer private lessons and group classes that are designed to help develop the skills that are needed to be a responsible gun handler. 3. We design your training based on your needs at the range(indoor/outdoor) at our private classroom or in your home. We have female and male trainers that offer dry fire and live fire training. 4. We offer classes that can be used to apply for your Florida Concealed Weapon or Firearm License. Please let us know how we can help you improve your skills. We have instructor certifications from; the NRA, Defense Training International John Farnam, RangeMaster Tom Givens, and Gabe Suarez. Pray That You Never Need It. Train Like It’s Going To Happen. Below is the sign up form for our newsletter. After you submit the form you will receive a confirmation email that you must approve if you want to receive our newsletters. If you decide at anytime that you want to be off our list, just unsubscribe at the bottom of any email we send you. Do not block or send to junk. Just unsubscribe. It is all automatic. If you ever want back on the list fill out the form again and acknowledge affirmatively the confirmation email.